Under positioning is where consumers in the market do not have a clear understanding of the key benefits of your brand. This differs slightly from consumers being unaware of the brand, and highlights a problem with the overall marketing communication of the brand’s positioning in the marketplace. Especially in a cluttered and competitive marketplace, clear positioning is critical to generate strong sales and a consistent market share. Being under positioned – that is lacking a clear position in the consumer’s mind – will result in reduced sales and profitability. 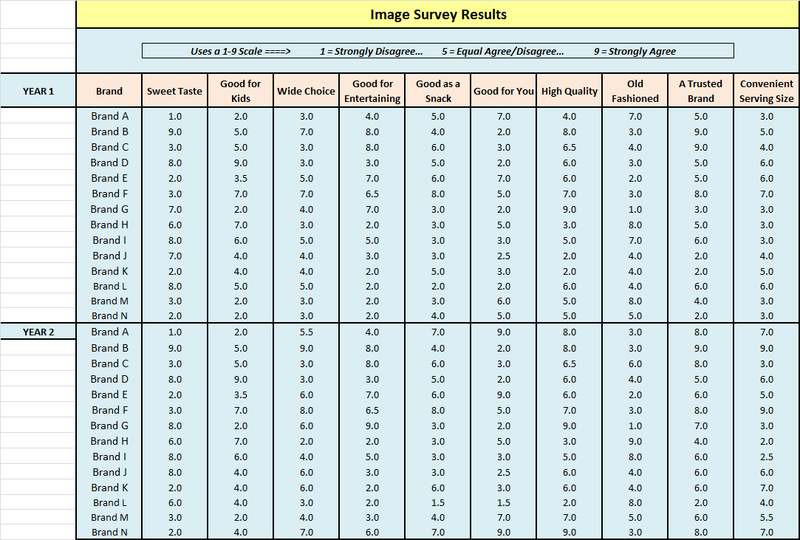 When in under positioned brand is represented in a image survey to consumers, the brands ranking/ratings will consistently be towards the middle of the answer scale. For example, if consumers are asked to rate a brand on a scale of 1 to 9, where 9 = a highly effective product and 1 = a highly ineffective product (and so on for various other questions and attributes) – and under positioned brand will typically score in the mid-range of 4 – 6. Because an under positioned brand scores in this middle range, the results of an image survey are sometimes misinterpreted. This is because an under positioned brand is likely to NOT be the worst rated brand in the competitive set. There will be other brands, where consumers have a stronger understanding of that brand’s positioning, where consumers will rate these better-known brands below and under positioned brand. Basically when consumers are asked about a brand that they do not have a clear understanding of, they are more likely to pick a “safe” middle school as an acceptable answer. Therefore, if a brand is consistently rated – across a range of attributes and benefits – in the middle range of the scale, then that brand is most likely well under positioned. 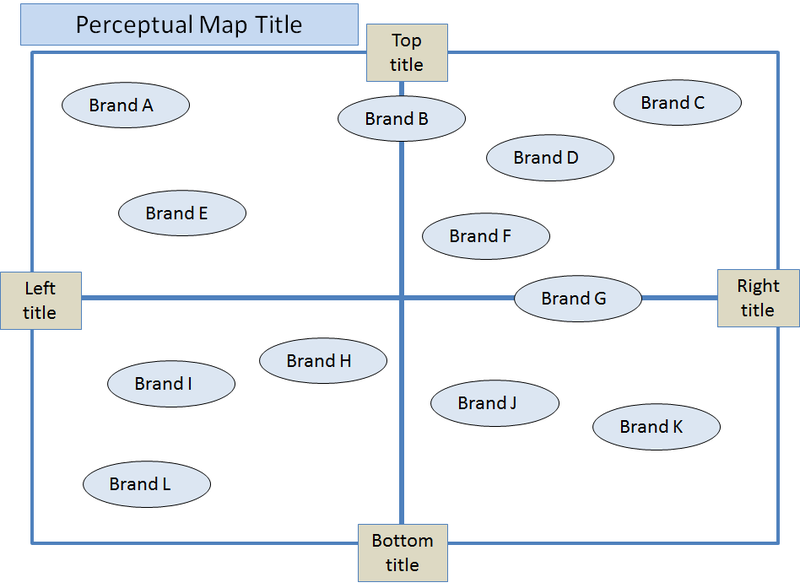 Please make use of the free perceptual map template on this website to help determine whether or not your brand is under positioned. If a brand is under positioned, then sales will be limited because consumers do not have a very clear understanding of the key competitive benefits of the brand. As highlighted above, this will also require the brand to be reliant upon expensive sales promotions (such as discounts) and will result in a fluctuating market share position. The counter situation to a brand being under positioned, is a brand being over positioned. This is where a brand promotes a very precise benefit that has limited appeal to the target market. This may happen in a very competitive and cluttered marketplace, but is not overly advantageous in a less competitive situation, or where the brand offers multiple benefits that have value to consumers. Over-positioning of a brand is probably more likely to occur in the early stages of the brand’s life, but needs to be improved over time by highlighting a greater extent of benefits and attempting to appeal to a broader target market. Some students still prefer, or feel comfortable, in making their perceptual maps in PowerPoint. Although not as precise and as easy as using the free Excel perceptual map generator available on this website, it is still an effective approach, particularly for college assignments and reports. Make a perceptual map using PowerPoint, as described further below as well. This is the easiest approach of your two choices. Simply click the following link to download the PowerPoint slide that contains the perceptual map template – which should look like the following PowerPoint slide. Click here to download the free perceptual map PowerPoint template. Click on all map elements and copy/paste to Word (or other program) for use in your report or presentation. You also use the same system (as step 3) for your brand (and attributes if required) – that is, using a text box, which is then moved to the right position on the perceptual map. If you want to change the shape of any text box -say to a circle – then click on the text box, which should bring up “format” on the top menu – then click on “edit shape” and select whatever shape you want to use. Probably the fastest and easiest way to make a perceptual map (or several maps quickly) is to use the free Excel template for perceptual maps available on this website. 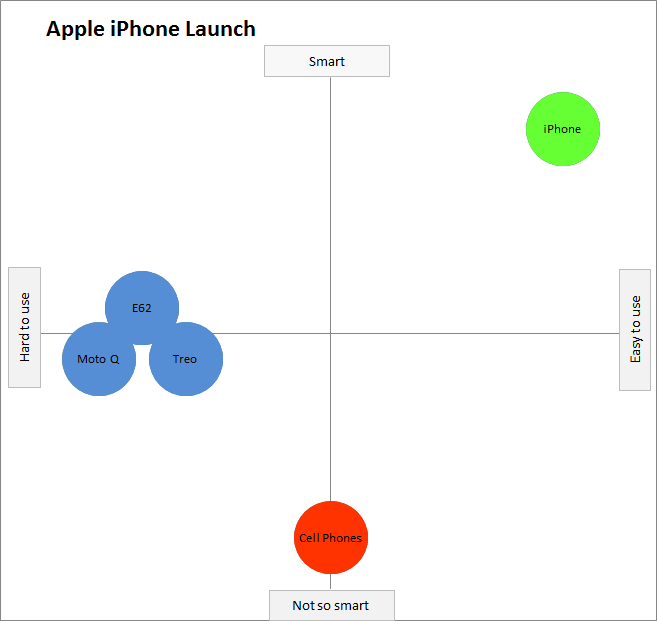 Steve then showed the following perceptual map in the iPhone launch (and please see the launch video below). Please note that this perceptual map was created in one minute using the free Excel template available of this website. Using a radar chart as a perceptual map is sometimes a very suitable alternative to the traditional the traditional two axis perceptual map. Generally this approach is NOT discussed in a marketing textbook, where the traditional discussion is on the more basic approach of a perceptual map. Please note that on this website, there are numerous resources for producing perceptual maps and how they should be constructed – please refer to the above menu. Radar charts look like spiderwebs. They are one of the “other charts” options in an Excel spreadsheet. If you have positioning/image data that is quite complex will has not been analyzed previously, then a radar chart is a good place to start sorting through the data and is often a better approach than a traditional perceptual map. 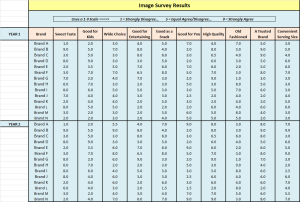 Take this summary of positioning/image survey results as an example. As you can see, there are 10 product attributes measured against 14 brands – that’s a total of 140 measures per year, for two years. That’s a lot of data the sort through to get a good sense of how the brands complete and how they are effectively positioned. 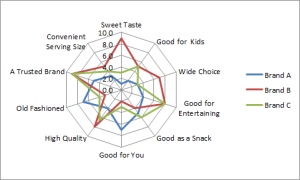 This is where radar chart comes in very handy to quickly summarize the data – note that there is a “how to” video at the end of this article to describe how to construct a radar chart. 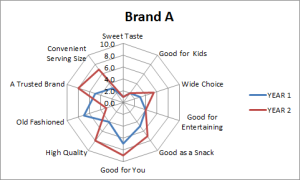 This first radar chart shows all 10 product attributes for the first three brands only . This allows you to quickly compare the brands on all attributes at once, in order to get a sense of where they stand out and how they compete against each other, as well as get a good understanding of what the brand is about. For instance, you should see that Brand B is a very sweet tasting cookie that offers a wide choice, is considered to be of high quality and is a very trusted brand. This is opposed to Brand A that is a not sweet (savory) product that is reasonably healthy, but is considered to be a little bit old-fashioned. Another advantage is called a radar chart is that can easily map how a brand is being developed over time and how the consumer’s perception of that product is changing. 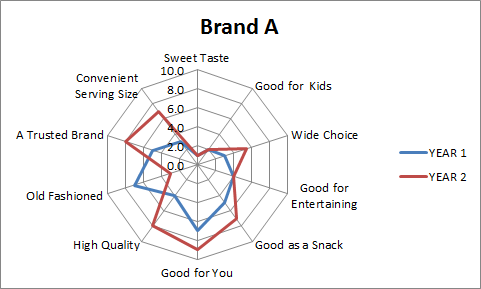 This is shown in the second radar chart positioning map, where Brand A’s perceived product attributes and image elements are compared on a year-by-year basis. As you can see this brand has significantly added to its serving size and choices, and is now being seen as more high quality healthier and more of a trusted brand. It is also reversed its old-fashioned image. 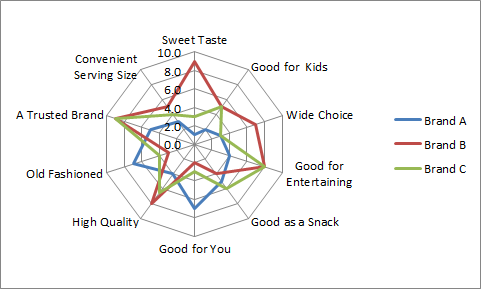 Tips for using radar charts: Try not to use more than four or five brands at the one time, otherwise the radar chart becomes far too cluttered and too difficult to read.